It’s fair to say six-piece bands are not particularly common. Normally when you head to a concert, you’ll see four people on stage, belting out your favorite tunes. With today’s band, their stage looks like the members of a Thanksgiving Day parade just let out and grabbed an instrument. Here’s the short list of instruments they play live: bass guitar, piano, violin, viola, cello, double bass, xylophone, glockenspiel, keyboard, synthesizer, French horn, accordion, harp, mandolin and hurdy-gurdy (maybe that list wasn’t so short after all). Win Butler and Josh Deu met during high school in Montreal. They became such good friends they decided to attend the same local college, Concordia University. It was there they had the idea of forming a band and went around to other local schools trying to find students in music or arts programs interested in joining. Getting a band together in 2001, they began making music and playing local shows. While the lineup seemed to be constantly changing due to fighting and break-ups, an independent label saw potential and signed them within the first year. They asked about the name of the band, to which Butler replied, “It’s based on a story that someone told me, not an actual event, but one that I took to be real. I would say that it’s probably something the kid made up, but at the time I believed him.” After hearing the story, Arcade Fire was born. Funeral was released in September of 2004. The album was given that name due to several deaths of band member relatives during its recording. The somber atmosphere while making the album influenced some of its overall tone, but it received almost immediate critical acclaim. It was named album of the year in 2004 and 2005 (due to delayed international releases) by many media outlets. After booking small clubs around the world for their tour, over half of them required changes because they needed higher capacity venues. The buzz created allowed the band to be featured on the cover of Time Magazine in Canada in April 2005. The television appearances and major concert bookings would only continue, with the band having an incredibly busy 2005. This album has always had me at a loss for description. I remember picking it up sometime around 2009 or so, and no one I knew had heard it before. When they would ask me what kind of music it was, I didn’t really have an explanation. It’s maybe an indie rock record if you took it to art school and wanted to use it for an independent art film. The production quality is outstanding, and for a debut album, nothing short of miraculous. Because of the varied instruments, the sound is unlike anything else being made today. Butler’s vocals are distinct, almost like a folk-rock version of Jim Morrison. It’s beautiful and harrowing, theatrical and sincere and bizarre yet all too familiar. Almost an enigma of music, defying a label and creating a new genre. This kind of laid back sound is not going to be for everyone, but if you look up the various reviews, there is a reason it receives constant 5 stars and 9 out 10s. 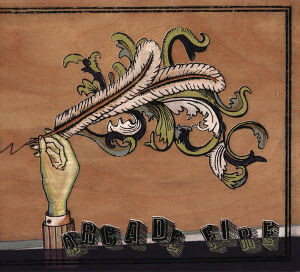 Take that spare fiver today and give Arcade Fire a chance.